While the film is nearing to its release on November 23rd, 2018, the makers promoted the film in an unexpected way today in the suburbs of Mumbai. Today morning opened with hue and cry at Oshiwara signal when people saw a man hanged. The makers hanged the dummy of a man committing suicide on the grand poster of the film. The Dark Side of Life: Mumbai City is a story about seven individuals and their lives, who are pushed under depression while battling their emotional and financial problems. What will be the fate of these individuals, it would be interesting to know once the film will hit the screens. Noted director-producer Mahesh Bhatt, who is marking his acting debut with this film also stars Avii, Nikhil Ratnaparkhi, Deepraj Rana, Alisha Seema Khan, Gul Hameed, Neha Khan, Jyoti Malshe, Irfan Hussein, Aarti Puri and Kay Kay Menon in the pivotal roles. 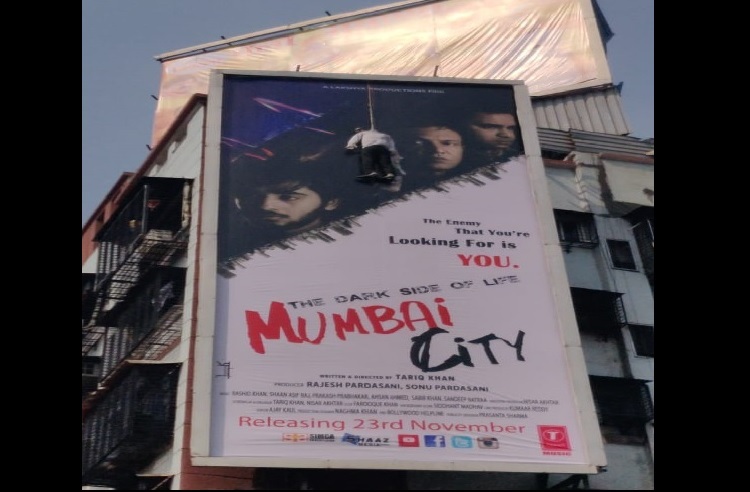 Written and directed by Tariq Khan, The Dark Side of Life: Mumbai City is produced by Rajesh Pardasani under the banner of Lakshya Productions.